‘Balloon’ Protest in London – Signifies Growing Global Anger Against The US Under Trump! The huge ‘Baby Trump protest’ balloon, scheduled to float above the capital city of London during the proposed Trump’s visit this week may be considered by some as childish. However, in the eyes of most, it is absolutely brilliant; ‘Trump Baby’ is deemed to be a moment of weaponised humour in a broad, colourful and beautiful protest movement. A balloon – or rather a giant, orange inflatable the size of a two storey house thus becomes their weapon of choice against this demagogue American President. In the face of this growing angry mood in London against Trump, his UK itinerary appears to be planned out carefully to avoid the capital and all of this ‘Baby Trump’ and the London protests/ demonstrations as much as possible. Of course, overlooking this stark reality prevailing among the masses to exercise their right of protest by such peaceful means against Trump’s visit, sadly there are also Islamophobia sections of the British Media ,which shamelessly tries to focus on the Muslim Mayor of London blaming him for taking the decision to allow this balloon on the London skies(which is not true). Max Wakefield, in an article (inews.co.uk 08/07/2018), discusses the underlying rationale for flying the balloon. The Sunday Mail, a Scottish tabloid, published a headline that read “Send him home to think again,” a play on a Scottish anthem. The editor said ‘Trump was “a threat to international stability, and he has a tenuous relationship with the truth,” adding, “We want to let him know that we don’t appreciate what he stands for”. Further, a “Carnival of Resistance” involving throwing rubber boots at a Trump doll is also being envisaged. Meanwhile, protesters across Britain are organizing themselves to play a cat-and-mouse game with Trump as he embarks on a four-day visit to the country, avoiding the areas of protests. Campaign groups including trade unions, environmental campaigners, organizations representing Latin Americans, Muslims and asylum seekers, and even a group opposing Trump’s decision to withdraw from the Iran nuclear deal, have organized a packed schedule reflecting an angry national mood against the psychopath in the White House more than the White House itself. As Prof. Scott Lucas, of the University of Birmingham quipped in a press interview ‘The man is the focus here. Trump has generated “the greatest amount of unease and tension against a single individual as opposed to an administration.”. Ironically, a petition last year to prevent Trump meeting Queen Elizabeth, on the grounds that an official state visit would “cause embarrassment to Her Majesty,” gathered more than a million signatures. However, the discontent with Trump and his psychopathic antics are not limited to UK alone. It has become a world wide phenomena; certainly a European one. Across much of Europe, anti-Americanism appears to be on the rise. Majorities in most of the European countries polled by Pew during the Bush years believed that the US, was looking out for its own interests and not taking into account the interests of other nations. Back then, America’s poor global standing was linked to fears of unconstrained U.S. power and its disregard for international norms or multilateral cooperation. Recent polls show further plunging ratings for America, and European leaders are once again critical of Washington’s foreign policies. Commentators are issuing dark warnings about the fate of the transatlantic alliance. It is no secret that Trump has an instinctive animus against the European Union and NATO, supporting Brexit vote in UK. He also reportedly told President Macron that France also should consider leaving EU too, and interestingly falsely claimed recently that the EU was created “to take advantage of the US”. While he is looking to improve relations with Russia, there has been thus an alarm at the deteriorating climate with his allies in Europe. Some have expressed fears for the future of NATO itself, and German Chancellor Angela Merkel has indicated that Europe may no longer be able to rely on its US ally. Trump also announced that he was pulling the U.S. out of the Group of Seven’s official statement of common values and even accused Canadian Prime Minister Justin Trudeau, the host of the G-7 conference, of “false statements”..
Western leaders who till now, tended to decide that the best way to address their concerns with him was to embrace his ways to varying degrees, have realized that the approach has hardly produced results; in fact, on almost all issues the West, particularly Europe, have had an interest about—from climate change to trade to Iran—the Trump administration has differed. However, some signals are now becoming visible that Europe is beginning to look further. It has finalized a free-trade agreement with Canada, and even closer to having one with Japan, while being in negotiations with Australia and New Zealand, and the Mercosur bloc of South American countries. EU is also getting more closer to Russia too, hitherto considered a virtual pariah in European capitals because of its’ adverse policies in Ukraine and Syria, and charges of undermining the electoral systems in several Western nations, and even getting close to China too. They came together recently as a united front on the Iran nuclear deal as well as when US withdrew from the Paris Accord on environment as well. However, the reality is that Europe has long become dependent on U.S.-led leadership for more than seven decades, and no Western country is still prepared to fill the void left by the U.S. Thus, the prevailing view among them is that US is going through a period of global retrenchment, and they hope that, as Canadian PM Trudeau once remarked, “at some point their common sense will prevail”. Many Europeans, in this context regularly lament about U.S. disengagement rather than an overreach of American power and see an America pulling away from the world order, which they say it once shaped. Precise the reason, President Macron nonetheless encapsulated European critiques of the American leader’s worldview thus, without criticizing Trump directly during his recent address to the U.S. Congress,: “We can choose isolationism, withdrawal, and nationalism. It can be tempting to us as a temporary relief to our fears. But closing the door to the world will not stop the evolution of the world”. In the world stage too, Trump has been flexing his muscles, in a show of American exceptionalism in his own brutal style, than how his predecessors did, to prevail upon the other nations; even US allies, to fall in line with US stance in almost debate in the UN. “American exceptionalism” has long been the ideological underpinning of – and justification for –the American empire and all of its military adventures. The American version of “exceptionalism” has a long history. Abe Lincoln arrogantly claimed that his government was “the last best hope of Earth.” From Reagan to Obama, and even Presidential candidates promoted the idea that ‘God has placed the destinies of an afflicted mankind,in American hands. Trump obviously went further. Under his ‘America First’ policy, he made his own rules in engagement with other nations. His ‘Make America Great Again’ prospectus is a jumble of instincts, prejudices and impulses. America’s allies, in the process have already concluded that Trump therefore is neither predictable nor reliable. Trump’s dismal track records has proved beyond doubt that he does not possess neither the mind-set nor temperament to lead the West; let alone the so-called free world. In fact, he has been branded as a narcissist by many US psychologists impairing his ability to see reality, making him bend reality to fulfill whatever fantasy about power, wealth, beauty, etc. Hearing him bully and brag, boast and bluster, threaten and lie, one feels a kind of dizziness and an excruciating pain that accompanies dangerously high blood pressure. Trump and his administration has been wreaking havoc around the world, despite his sham shows like his peace accord with North Korea. Trump’s Deal Is All Show, No Reality in Pyongyang as per experts. US growing global isolation was clearly seen in the near unanimous UN Security vote against US on Jerusalem in the recent past. The worst effect his style of Presidency has had on the global plane and in US/Europe in particular, was his inspiration to the alt right populist racist and Islamophobia movements, which have shown a significant rise since his assumption to office. His uni-lateral recognition of Jerusalem as Israeli capital and his adventures in the ME thanks to puppet regimes in the Arab world particularly Saudi, Egypt and UAE have caused a terrible catastrophe in the region, hell- bent on drawing Iran to the point of war along with his Zionist counterpart Bibi. Despite Trump’s effort to isolate Iran in the ME, Iran however is and will remain an increasingly assertive and influential power in the region, defending and promoting its’ interests and competing with the Saudi regime. Just as news media outlets world over and even comedians struggle to keep pace with the controversies and personalities at Trump’s White House, the people of US are yet to wake the reality that they have knowingly or unknowingly ‘gifted’ the world a psychopath who is on a mission to make it worse off by the day, by both his commission and omissions. Perhaps, America will need to learn new rules and play differently while respecting the dignity of other nations , in the new balance-of-power world, where others have assets and policies the U.S. does not and cannot control. In the meantime, the international community should realize that Trump’s impulsive actions are upending the international order that has been in place since the end of World War II and that America has lost its dominant role in world affairs. World leaders and the global community have taken their own silent poll on Trump and found him wanting in about every department. Trump is a global liability — not a global leader. The earlier he is assigned by the US public to the dustbins of history, the better for them and the world at large. 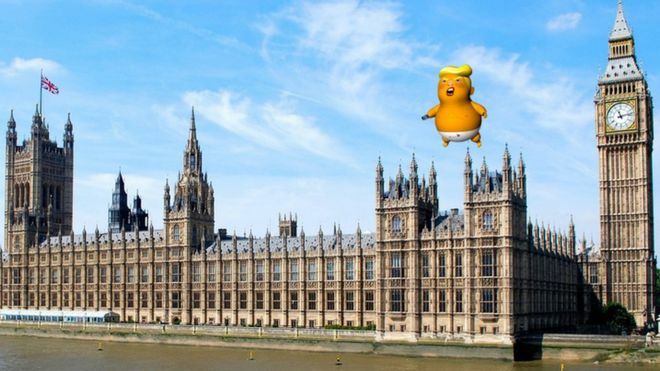 Perhaps, the Baby Trump Balloon above London in his diapers should remind him that he needs to grow up. The world today is much different to what his advisor John Bolton paints and what he barks in futility. Trump is a showman. His experience is in organizing beauty pageants, and being a reality show host, and he has no clue as to how to be president. His so called “successful”meeting with the North Korean leader was just all show. Kim got the exposure he wanted, sanctions eased, and military drills with South Korea halted. All Trump got was a photo op, and no deal, and certainly not the Nobel peace prize he thought he deserves. He is all show and no substance. A crude, rude man, with no class despite the wealth. Money cannot buy class and Trump is the prime example of this theory. But there is something good about, he is a true reflection of the American society. If his behavior is anything to go by, then Americans have got a true representative of themselves for the world to see. That is like saying MR is a true reflection of Sri Lankan society! That is nonsense! Just because Trump rallied the riled-up and disgruntled extremist rednecks amounting to 30% of population, a dominant, hardened segment of Republicans, it is short-sighted at best to characterize as reflecting the entirety or even the majority of the American Society. 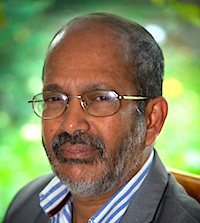 What Trump did is no different from what Banda did — convinced a block vote via the “Sinhala only” racial cry to distract from the State’s failure to get the economy going, and convince the gullible that Tamils were to be blamed. You know what happened to the country as a consequence — was reduced to earning foreign exchange by exporting mothers, wives, sisters and daughters to the Arabs! 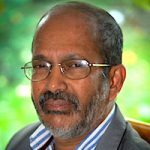 Banda did not reflect the Sri Lankan society – just the gullible know-it-alls. “That is like saying MR is a true reflection of Sri Lankan society! That is nonsense! Kumar R – you are wrong . MR and Reginald are true reflection of Sri Lankan Sinhala Buddhist society! The two cases of Trump and Banda and how they both came to power are like Apples and Oranges. In America the minorities, the Blacks, Latinos, Chinese primarily are harmless minorities just going about their daily lives. In Sri Lanka, the problematic minority at Banda’s time, the Tamils, were a bunch asking for a thundering slap on their faces. They needed to be killed like dogs at the banks of Nanthikadal sooner or later. Do you think the Blacks ever had a leader like Chelva who tried to disintegrate America along racial lines? What would you think would happen to the entire Black race if someone even tried those gimmicks in America? Obviously your cave dwelling keeps you uninformed on what Trump called the minorities, before the elections, at the elections, after the elections, and to date! I wonder where exactly the thumping “slaps” your women are receiving from the thirsty Arabs. Perhaps fair-skinned podi, podi thambilas will tell the story. Seems like those women are getting slapped in the same place those of your ancestry received from the thuppahi Portugese, which entitled you to the “Perera” monicker! Or Reginalds, now desperately trying hard to slither into the mainstream Sinhalese by boot licking. Even the thug leader of the Philippines couldn’t tolerate Arab’s treatment of his women-folk and banned pimpish exports to the ME – but your gross lack of cohona’s leaves your women little alternative! Wake up Regie. LT.reginald. Even after retirement you seem to be suffering from gun culture, Why was Martin luther King Murdered, Any idea? Yeah! Exactly how I feel too. You put it so nicely. Great that you pointed it out , one can go a little further and include citizenship too. You are a prime example. May I humbly request for your Monetary Wealth, Qualification and your mega achievements in television and life plus very important Class of social standing to publish with your opinion. Smooth talking Dude Obama was also doing same things, quietly, with his drone wars and rendition of “terrorists” and Gitmo — to make America First and Great again and screw the rest of the world. This is why the Mideast is a basket case today ! The USA’s biggest embarrassment continues to put his foot in his mouth wherever he goes. Hopefully this tactless buffoon will not get a second term and the world will finally be rid of him. Trump himself being an immigrant wants to punish babies who to migrate like his ancestors did. What a tyrant he is. Let him not enter any civilized country. Lukman Harees: TRUMP is a businessman. Do you think he wants to be unpopular in the whole world and become a loser in his business interests. How about if he could expand his hotels and Golf resorts after the time as the president. At least he helps his children to be bigger than him and he has hotels and gold courts all over the world. So, do you think Trump is doing what he does even when other means are available. His country is trying to uplift them via the only way they know. But, the truth is everything is cyclical and it nevers goes step by step and higher and higher.Understand the lesson for Sri lanka in this. Sri lanka tries to keep on importing and getting loans in every way possible and win it. I heard LAte Hemantha Warnakulasooriya briefed RAnil that Maithripala sirisena also was involved in the bond scam. His intention would have been to hear what Ranil would say. Instead, Ranil Kept quiet. I am pretty sure, eventhough she has a muslim name, she is not wahabi. Instead she is more English with the english accent, eating english food, wearing english cloths but covering the head to show that she is muslim. Besides, it is good to use a muslims catch eahabis as we do with the provincial govt of wigneswaran the Tribalist. How many Tribalists are sri lankan Tamil Politicians. IS this women say death to English ? Between you and Trump I do not know who is more daft. I think that I will settle for you because you think that trump is clever. SJ: what is your achievements in your old life. TRUMP for his life who is not educated as you and; who did not have a job with a plump salary who started as DAD’s carperntry shop, what do you think high end tourist hotels and billions of wealth, is he better than you or not ? Who is DUMBER ? Trump has adopted this tactic of doing what others do not expect him to do. This may work in business but not for the President of US (or for that matter any country). Hitler was a bad man who took his life when it comes to the crunch.But this guy…. Who knows if some people in US wake up to fact that he is an oddball and do something about it.Perhaps they will vote against him and I blame that horrible Clinton woman who chased the good voters to Trump. Hope the congress will impeach him..It may be difficult as impeaching Hitler in 1943. Excessive greed and jealousy are the main weaknesses of White people in Western countries. They do not care what happens to others as long as they can exploit the resources of the world for their benefit. Because of jealousy, they do not want to see any other country becoming prosperous. During the last two decades China made a tremendous economic progress and on the way to become the number one economy in the world. USA which is the number one economy in the world is doing everything possible to block China’s economic progress so that USA can remain as the number one economy in the world. USA did not want China getting a foot hold in Sri Lanka which is a strategic place in Belt and Road Project. The ‘Regime Change’ project was initiated by USA to oust President Rajapakse because he was leaning towards China. They managed to get rid of President Rajapakse but failed to achieve their objective. Ranil had no choice but to go and sit on lap of China and give Hambantota harbor to China and allow to continue with Port City Project under a different name. “Russia has slipped to third place in military spending after the US, China and Saudi Arabia. The US and its wealthy allies account for two thirds of world military spending. In fact, the US total military budget (including for nuclear weapons and foreign wars) is about $1 trillion, 50% of total US government discretionary spending”. Lakman Harees. Read the above paragraph. USA has a huge military budget and over thousand military camps all over the world. some of their war exercizes are flying a huge loaded aircrft from guam to south Korea and bomb the OCean and fly back. so, what should TRUMP do. He has to be protective in order to fulfill the wishes of the voters to whom he promised. There the president, unlike in Sri lanka, is a puppet of the deep state. So, your explanation is wrong. The way London Mayor protested- unprecedented! No surprise London knife crimes is ramping up every month no worries. Muslim mayor Kahan’s priority is to approve to hoist a baby Trump balloon “Low IQ” ( Trump ) protestor’s. KP, now there is a lady mayor in Harrow with a veil. So cutting necks will double. These street walkers may be the ones threatening royal children, so they can take over and run their anti-Christ kingdom for a short while not knowing their real end. Excellent organisers of protest marches where ever Trump went, and specially when 2 believers Putin and Trump met. These rebels want to unite/globalize, but will fail. Also JS thinks Trump is a slave of “deep state” Wrong. Trump cares not for compliments. Are like slaves to them. They do not talk ..or take action . They expected, Londonistan mayor included, thousands. But only thirty protesters came. Note that the newly elected President of Mexico, a realist has already activated special army units to stop and arrest any forced entry into Mexico from her Southern border, and simultaneously stop any forceful “migration” of Mexicans or others into the U.S. This is fundamental. Will Sri Lanka, India, China, Russia, Japan or the Middle Eastern countries like Saudi allow any undocumented individual?! Come on, think! Londonistan!! Did Kumaran learn to speak flawless Trumplish in under two weeks?